Remember “Java And Jams” in downtown Birmingham? A few years ago I played in a show there with a couple of better known songwriters. We were doing a song swap, and Marty walked in. He didn’t know who I was, but I’m sure he knew the other two performers. This was one of many ways that he showed his support. I remember feeling that the mood of the room picked up because a celebrity had walked through the door. In the years since this happened, I have learned why Marty Eagle is so highly respected in the community. Marty has been diagnosed with lung cancer and Birmingham musicians are eager to help the man that has helped and supported so many others. If you don’t live in the Birmingham area or don’t have connections with Birmingham, then you may not understand why Marty is so highly respected. Marty owns and operates Marty’s Bar in Southside. Oh, but there is MUCH more to it than that. I doubt you can find anyone that is more encouraging, a bigger supporter of and a bigger believer in local musicians. 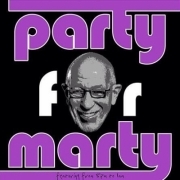 Click Party for Marty to learn about the show on 1/1/13 and to help out.